Krystins Aft Beach Cottage offers pet-friendly accommodation in San Diego 5 km from SeaWorld San Diego. Free private parking is available on site. There is a dining area and a kitchen complete with a dishwasher an oven and microwave. A flat-screen TV with cable channels and DVD player is provided. Other facilities at Krystins Aft Beach Cottage include a barbecue. The apartment features free WiFi throughout the property. University of San Diego is 7 km from Krystins Aft Beach Cottage while Old Town San Diego State Historic Park is 8 km from the property. 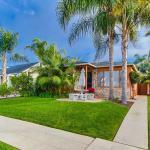 The nearest airport is San Diego International Airport 10 km from Krystins Aft Beach Cottage.